No world has been left untouched by the Jihad. As the great states battle for survival against their fanatic enemies, the fringes have been left to their own devices, at risk for any number of plots by nearby opportunists and marauding brigands. While some interstellar companies have come to see these frontiers as a potential new customer base for defensive hardware, there are also many others on these “back woods” worlds who have called upon their own resourcefulness, to bring new weapons to bear in the war against eternal chaos. Experimental Technical Readout: Boondocks samples the custom and prototype designs that have begun to turn up on the lesser-known worlds of the BattleTech universe. Each design featured in this book incorporates some of the latest technologies developed by the realms of the Inner Sphere as the war against the Word of Blake continues. These technologies—first described in Tactical Operations—have yet to achieve widespread production, but each has been prototyped and rushed to the field for their desperate consumers. 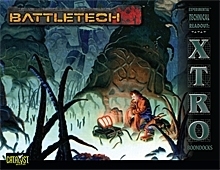 Statistics and Record Sheets are included for 13 new experimental BattleMechs, vehicles, and aerospace units presented in this book, ready for play in advanced BattleTech games.